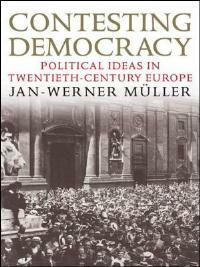 Jan-Werner Müller presents a major account of political thought in twentieth century Europe. Müller argues that the Second World War was pivotal in shaping the democratic values so familiar in the European community. Although the author carefully considers the most familiar thinkers alongside those now forgotten, Bill Kissane feels that the book still tells only half the story. Contesting Democracy: Political Ideas in Twentieth Century Europe. Jan-Werner Müller. Yale University Press. 304 pages. August 2011. Jan-Werner Müller’s Contesting Democracy is one of a number of important works giving a fresh perspective on Europe’s history in the twentieth century. It sits alongside Mark Mazower’s Dark Continent and Eric Hobsbawm’s Age of Extremes as a history of political thought, and its vivid portrait is of a continent constantly questioning the meaning of democracy. It shares Mazower’s ‘dark continent’ theme, stressing the precariousness of the democratic order salvaged from the wreck of the Second World War, and like Hobsbawm’s work it stresses ideology, with the author covering numerous political thinkers. Rescuing some great minds from obscurity, Müller also turns to thinkers with whom many will be acquainted, such as Lukács, Marcuse and Sartre. The events of the last century meant that the drama of European democracy was played out on a global stage; collapsing empires, two World Wars and the Cold War, and relentless globalisation all left intellectuals wrestling with common themes. How should mass society be governed? Could modern states be designed to enable popular self-government? How could bureaucratic and technological resources be employed to shape popular culture? Müller coherently covers the Christian, Communist, Fascist, liberal, Nationalist and socialist answers to these questions, beginning significantly with Max Weber, whose vision of modern society encased in an iron cage haunts this book. With the Cold War dividing the continent into two blocs, each competing for the mantle of popular self-government, every major thinker of the time had to decide whose arguments they found persuasive. The end of the Cold War brought democratically-elected governments for all countries in Europe previously controlled by the Soviets, and for Müller this outcome demonstrates the wisdom of the democratic Christian values of the post-1945 west-European settlement. Müller argues that the horrors of the Second World War came to act as the fulcrum of experience through which Europe disciplined its obsession with democracy. It is here that the author differs from Stein Rokkan, Greg Luebbert, and Dirk-Berg-Scholosser, for whom the period between the World Wars was most decisive in shaping European democracy. Müller writes that Christian democracy was imposing enough to withstand challenges from both the radicals of 1968 and the dissidents of communism. The reconstruction of Western Europe after the war prefigured what Czech philosopher Jan Patŏcka called ‘the community of the shaken’: those who saw the full horrors of totalitarianism under communism. Into their political vocabulary came a moral imperative, an example of which was the ‘personalism’ of French Catholic thinker Jacques Maritain. The central message of Müller’s book is that if Europe has found an ethical solution to Max Weber’s vision of the iron cage, the post-war deification of Christian democracy was its moment. The consequence was a disciplining of democracy, and constitutional orders constructed on the logic of ‘never again’. These provided for human rights, strong constitutional courts, and the delegation of authority to supra-national bodies. Müller’s interpretation of the securing of Christian democracy as the continent crossed an epochal threshold after 1945 follows Koselleck’s model of crisis unfolding as a singular accelerating process in which conflicts break out and burst the system apart. Implicit in this conception of crisis is that of resolution, involving compromises between workers and employers, between Catholicism and the democratic state, and between the nation-state and the European project, all secured by Christian democracy. Like Social Democracy in Scandinavia, this was based on an accommodation of social forces. The resolution was most dramatic in France, Germany and Italy. None was a stable democracy before 1939. All had experienced Fascist rule. They then became the backbone of the European Economic Community and thus emblematic of the apotheosis European democracy experienced after the war. The problem is that not every European democracy required this apotheosis. In 1939, Belgium, Denmark, Finland, Iceland, Ireland, Luxembourg, the Netherlands, Norway, Sweden, Switzerland, the United Kingdom were Europe’s stable democracies. Their systems had roots in the nineteenth century, and long had been growing and internalizing democratic values and practices. The successful European sequence was one of ‘liberalisation before inclusiveness’. Liberalisation took place over decades or more: universal suffrage came last. Radical rightist movements, strongest in Finland, had generally been suppressed before 1939. When it came to post-war reconstruction, democracy worked in these countries much as before. In this ‘Age of Extremes’ all but one of the durable democracies were small states: none had expansionist ambitions within Europe. Unlike France, Germany, and Italy, their sources of democratic stability were largely sufficient to themselves. The theme of new beginnings pervades the literature on democratization. Significant changes are seen in terms of ‘ruptures’, ‘critical junctures’ or ‘turning-points’. Apotheosis, when politics becomes elevated to the religious sphere after a crisis that confirms the need for ethical principles, is another. Yet by understanding European democracy through its intellectuals, (often at war with themselves), incremental change can be obscured. No doubt the war was decisive in geo-political terms, but the Christian Democratic formula applies to West Germany and Italy. Belgium, the Netherlands, and Switzerland, were consociational democracies. The five Nordic countries were becoming social democracies. Britain and Ireland have intertwined histories. In terms of the acid test Mueller himself applies – whether democratic debate led to new institutional forms – Finland’s was the first durable semi-Presidential system, Ireland’s 1937 constitution blended liberal democracy with Catholic social teaching, the Netherlands established the power -sharing model, and Switzerland Europe’s first democratic federation. Most of east-central Europe developed hybrid systems, just as many post-communist countries are now doing. There is much attention here to authors that achieved international fame, (with accompanying photos) but little on democratic thinking on the periphery. Scholars like Arend Lijphart are ignored. There is no discussion at all of the concept of neutrality. Contesting Democracy does have its limitations. Not every country required the apotheosis of Christian democracy, nor were Europe’s stable democracies shaped in equal measure by the horrors of the last century. Further afield, democratic values did not just radiate outward from larger European states, but many breakthroughs took place on the periphery, changing in turn the core. This book, for all its ambition, tells only half the story. It draws us to the heart of a dark continent, convulsed in crisis partially because it overreached itself at its outer limits. The resolution of this larger crisis involved an array of non-Europeans who contested democracy in their own way. Bill Kissane is a Senior Lecturer in Political Science at the Government Department of the London School of Economics. He has also taught for Greenwich University, Helsinki University, the University of Notre Dame, and New York University. His research interests lie broadly within the areas of comparative and Irish politics. He is currently writing a book on the relationship between constitutionalism and democracy in the Irish Republic, as well as undertaking a comparative study of regime formation after civil wars. Read more of his posts on the LSE British Politics and Policy blog.